Team Building at Altitude Adventure! In life we come across many different people and personality types. In places such as work, school and University we have to find ways to work effectively as a team to produce great results. If you’re part of a team and you feel as if your group need to improve communication skills or team morale, there’s no better team activity than Altitude Adventure to bring everyone together for a great time! What makes Altitude Adventure perfect for Team Building? 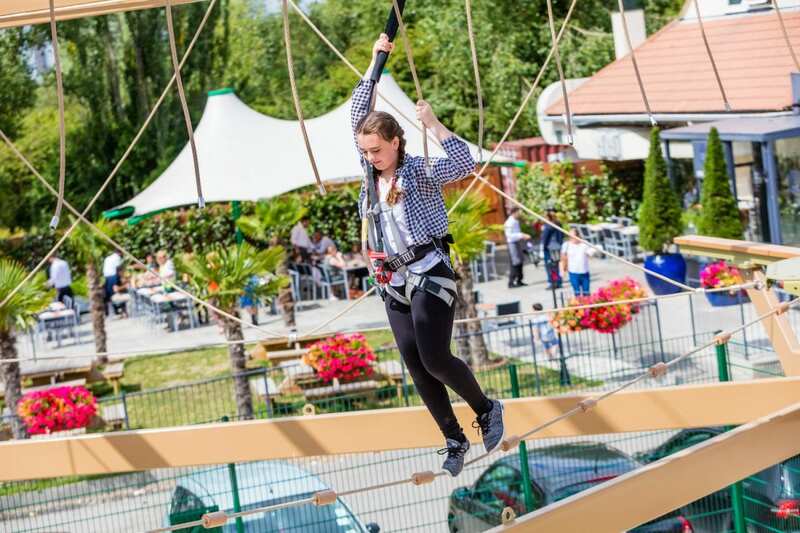 Altitude Adventure has over 30 different elements for everyone to try. It can be a challenge at times (especially for the ground lovers) but it’s the concept of a new challenge which is so effective in bringing everyone together. In any case, delving into a new challenge can be daunting and the very beauty of this is that it forces your team to rely on one another for support to complete the course. In order to get to the next platform, you will often need encouragement from members of your team especially on the second level which sees a height of 32ft. Not only will you need encouragement but team members who have completed the element before you can often offer you advice on how to complete the element in the best and quickest way possible, for example tips on how to manoeuvre your feet on our tight rope elements in order to retain your balance. How will this change the attitudes of the people in my team? Due to the nature of the elements, members of the team will need to call on a number of skills that may already exist or attributes that will develop throughout the high ropes session. This includes working collectively; demonstrating information retaining skills through listening and responding appropriately to their colleagues’ suggestions; communicating their thoughts effectively; responding to challenges and actively seeking solutions to problem solving activities. When tackling activities in a workplace environment that call on these qualities, teams and groups will be taken back to their Altitude experience and be reminded of how simple communication with colleges can be when the pressure. It can result in producing a more effective and efficient team and also improve the team’s collective focus on completing the task at hand. Poor attitudes and behaviour within institutions also contributes to low team morale. A lack of motivation in what you do can lead to a change in behaviour. Team building at Altitude Adventure provides team leaders with an effective behavioural solution that avoids needing to force a strategy to improve individual behaviour. There may be certain individuals who will benefit more from the experience impacting a change towards positive behaviour back in the workplace/school. This is because Altitude Adventure provides a different environment and new learning experiences through new challenges not immediately associated with work/school. A session at Altitude Adventure can provide the motivation to a demotivated individual to experience learning in a new environment and experience success. By experiencing achievement, there is the potential for perceptions to teamwork to change and motivation increase as the learner seeks further opportunities to receive praise and recognition. At Altitude Adventure our high ropes instructors are always enthusiastic and eager to see individuals succeed. Our instructors’ number one priority is to ensure that everyone has a great time and can conquer any fears they may have. This support from the instructors will also be greatly beneficial to your team as their will be someone to guide them along the way and help the team maximise their communication skills. So, what are you waiting for? Book Altitude Adventure today for a phenomenal team building experience and see the changes in your work space immediately!